View More In Curriculum Sets. Nasco Classroom Olympiad Part 2 - Science Education Program - SB42632: For your STEM curriculum. More great games! Keep the spirit of Olympic competition alive as your students learn the Scientific Method and cooperative learning skills. 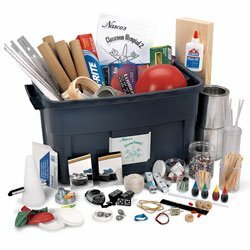 Nine new events: sailing; fettuccine physics; estimation guesstimation; shadow box; air cannon; marble trampoline; balloon bomber; pencil pendulum; and battery-powered car. Grades 3-8.